Developing a credentialing and privileging program for clinical fluoroscopy users involves more than developing and providing a didactic component. Establishing a program requires for- mal support by healthcare management, as well as acceptance and participation by the medical staff. While credentials review and the privileging process is well known by physicians who have been granted privileges at hospitals and other health care facilities, medical physicists and health physicists may not be as well acquainted with the process and corresponding requirements. This report is designed so that each section is essentially self contained to facilitate use by the reader who needs information from a specific section. As a result, redundancies occur. 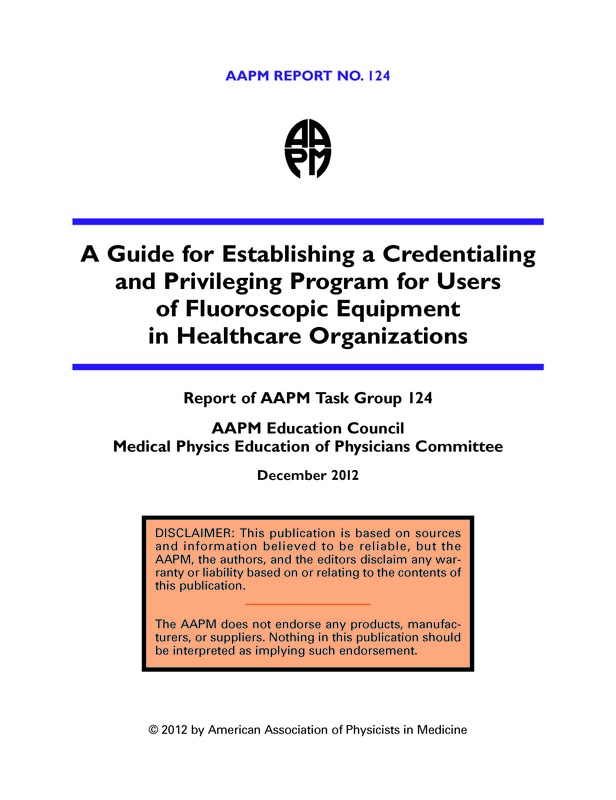 This guide is intended to assist the qualified medical physicist (QMP), the radiation safety officer (RSO), credentialing staff, and chairs of affected departments by providing an overview of the credentialing process and guidance for incorporating fluoroscopy users into the process. Resources and recommendations for developing and maintaining a fluoroscopy safety training program are also provided. Fluoroscopy use in nearly all areas of medicine continues to increase. This rise in use has largely become possible due to design improvements that make it easier for users to produce clin- ically useful images. Concurrently, fluoroscopy equipment, including mobile units, has increased in capacity and complexity. To date there is no nationally accepted uniform standard for educa- tion and training on the safe use of fluoroscopy. This report is an effort towards that goal. Training for the safe use of fluoroscopy has not kept pace with expanding clinical applications. Fluoroscopy credentialing and privileging programs are needed because of the tremendous growth in the use of fluoroscopy by individuals whose medical education originally did not include formal training in fluoroscopy. Physician specialists utilizing fluoroscopy include radiologists, cardiologists, gastroenterologists, orthopedic and vascular surgeons, neurologists, urologists, pulmonologists, pain management specialists, and radiation oncologists. Non-physician fluoroscopy users include radiology assistants, speech pathologists, nurse practitioners, physician assistants, and radiologic technologists. Many have not been trained in the principles of radiation protection, radiation biology, radiation or imaging physics, radiologic anatomy and physiology, electrical safety, positioning, or equipment operation. Training fluoroscopy operators and staff in imaging physics and radiation management should lead to improved patient care through the more judicious application of fluoroscopy imaging. Without proper education, training, and experience, the patient, operator, support staff, and facility are at increased risk for radiation related injuries. Even with adequate staff training and experience and with properly functioning equipment, the risk of serious injury can be high whenever multiple fluoroscopically guided interventional procedures are performed on the same patient within a short period of time. An example of serious injury is shown in Figure 1. Because radiologists, cardiologists, imaging medical physicists, and radiologic technologists are trained in the applications and use of fluoroscopy and associated radiation safety aspects, they should participate in the development and implementation of training programs and be part of the credentialing process as well. RSOs should also participate to assure radiation safety com- pliance, program coordination, and oversight.